The anti-summer beach read of all time, Peter Benchley’s Jaws was a surprise hit when it arrived in bookstores in the middle of winter in 1974. The seminal shark tale spent over 40 weeks on the New York Times bestseller list and sold well over 5 million copies in its first year. But that was nothing compared to the much larger fish that was on its way to terrorize the psyche of unsuspecting movie- and beachgoers everywhere. Steven Spielberg’s Jaws was released on June 20, 1975, swallowing millions at the box office and ushering in the age of the summer blockbuster. It made over $470 million worldwide on a mere $7 million budget and became the highest grossing movie ever at that time. People may have been afraid to go in the water, but theaters were packed and sales of the book more than doubled. Jaws became a cultural phenomenon and helped launch the career of one of the greatest directors of all time. 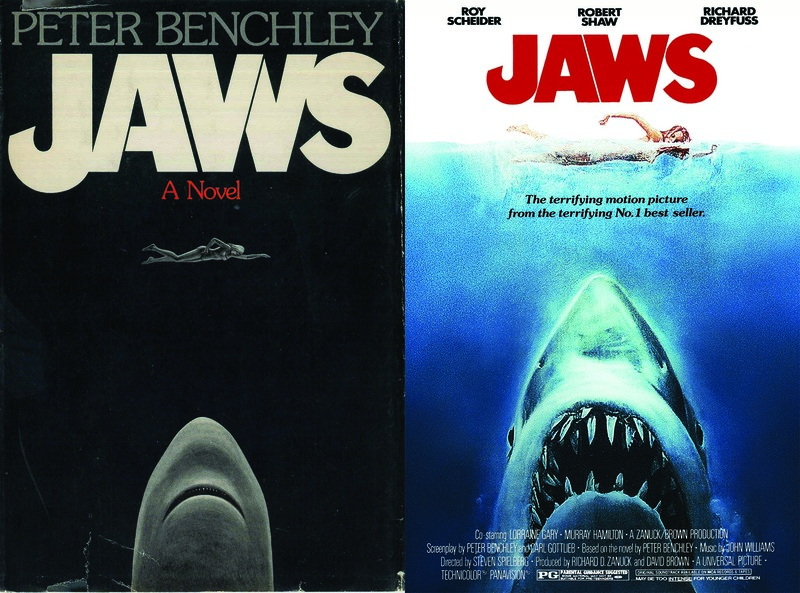 Benchley’s Jaws isn’t just a story about a killer shark. Published in the middle of the 1970s economic recession, it’s an ambitious novel about a town living on the edge of financial despair. The residents of Amity, New York, a quaint seaside community on the southern coast of Long Island, are mostly working class fisherman and business owners who depend upon the influx of wealthy vacationers each summer to keep the town afloat. One bad summer can shut down stores and restaurants and wipe out entire livelihoods. So when news of a shark attack starts to circulate, the mayor’s mandate is to keep the beaches open, Great White be damned. The real danger to Amity, they fear, is not the shark, but the financial ruin that follows in its wake. Just don’t try telling this to Mrs. Kitner, whose young son Alex is savagely snapped in two during the second shark attack. It’s left to the town’s police chief, Martin Brody, to decide whether to close the beaches to keep people safe, or leave them open and keep his own job. There’s only one real answer: kill the shark. The great fish moved silently through the water, propelled by short sweeps of its crescent tail. The mouth was open just enough to permit a rush of water over the gills. There was little other motion: an occasional correction of the apparently aimless course by the slight raising or lowering of a pectoral fin–as a bird changes direction by dipping one wing and lifting the other. The eyes were sightless in the black, and the other senses transmitted nothing extraordinary to the small, primitive brain…it survived only by moving. Benchley said that he was inspired to write a book about sharks after reading about a Great White that was caught off the coast of Long Island, as well as several real-life shark attacks. He portrays the shark not as an evil monster, but as an efficient killing machine that commands respect as well as fear. His description of the attack on the Kitner boy is as cool and mechanical as the shark itself, but no less chilling. Spielberg liked the book, but he wanted to focus more on the shark and less on the extraneous and melodramatic subplots. The problem was that the producers had promised Benchley that he could write the screenplay (usually a bad idea), and he had a difficult time conforming to the director’s vision. In the end, the author turned in three drafts before new writers were brought in to make extensive revisions, including Carl Gottlieb, a comedy writer who would eventually share the final screenplay credit with Benchley (both writers also have small parts in the film: Benchley as a TV reporter and Gottlieb as Meadows, the newspaper editor whose role in the film was, ironically, greatly reduced from that in the book). The main cast was led by Roy Scheider. Lorraine Gary played his wife, Ellen, and although she happens to be the wife of studio head Sid Sheinberg, it’s clear that she has a natural rapport with Scheider. It probably also made it easier for Spielberg to get his first pick to play the tall, blond, and handsome Matt Hooper. The studio wanted red-hot Jan Michael Vincent, who looked the part, but the director had set his mind on the more nebbish-looking Richard Dreyfuss. The actor had to be convinced more than a few times to take the part, and although he complained later that the character was woefully underwritten, his Hooper is a richer one in the novel (and he doesn’t die!) Finally, English actor Robert Shaw was cast as shark hunter Sam Quint. One of the biggest changes was losing the distracting love affair between Ellen Brody and Matt Hooper (over 60 pages were devoted to it in the book!). This allowed Brody’s family life to anchor the film, along with his friendship with Hooper. Also cut was an unnecessary backstory about the mayor’s involvement with the mob. But the scenes of the shark in the movie remain largely faithful to those in the book. Both open on the now iconic scene of a teenage girl and boy frolicking on a beach at night–he passes out drunk on the sand, and she goes for a late night swim, unaware of the monster lurking below. The book gives us the terrifying account of the attack from the perspective of both the victim and the shark, but the movie taps into our primal fear of the unknown. Spielberg’s mechanical shark (nicknamed Bruce) was famously temperamental, preventing the young director from showing the Great White as often as he intended to on screen. But by borrowing a page from Hitchcock and using clever camera techniques to suggest a shark in the water without actually showing it, Spielberg created a far more effective and suspenseful film than the one he had planned. It’s worth noting that Bruce appears exactly five times in the film, the same number of times as Benchley’s shark. There are two scenes added to the film that set it apart and above the novel. And the shark isn’t seen in either one. The first is a tender, human moment between a father and a son. The scene opens with Brody quietly sitting at the dinner table with his four-year old son, Sean. It’s been a tough day for the police chief. He’s feeling guilty for the shark attacks and doesn’t know how to stop them from happening again. But as he’s resting his head on his hand, or taking a drink from his glass, or folding his hands up in thought, his son is watching him and copying every gesture. Brody sees him out of the corner of his eye and plays along by making a silly face, his burden lifted if only for a little while. It’s easily one of the best father-son exchanges on screen. And if there was any doubt that Lorraine Gary deserved the role, just look at her face as she watches them from the kitchen doorway. The second scene is one of the great monologues in film history, and Spielberg has said that it’s his favorite part of Jaws. During a whiskey-soaked calm in the cabin of the Orca, Quint recounts the horrific true story of the USS Indianapolis. He tells Brody and Hooper that he was on board the ill-fated Naval vessel when it was torpedoed by a Japanese submarine, sending its crew of over a thousand men into shark-infested waters. It was added to the film by Howard Sackler and John Milius, uncredited writers on the film, as a way to illustrate Quint’s Ahab-like obsession with the shark. Shaw himself contributed to the final version used in the film. Read it here. It’s a wonderful piece of writing, worthy of any novel. Jaws made sharks our national obsession and our collective fear. It also had a profound effect on both Spielberg and Benchley, though in very different ways. The movie was plagued with production problems, all well categorized in the excellent behind-the-scenes documentary, The Making of Jaws. Over budget and behind schedule, the young director feared he’d never be allowed to work on a movie again. Instead, he became one of the most prolific and popular directors of our time. He cast Richard Dreyfuss in his follow-up movie, the alien epic Close Encounters of the Third Kind, and went on to direct blockbusters like Raiders of the Lost Ark and E.T. But Spielberg hasn’t jumped into the water with another shark yet, mechanical or otherwise. In The Making of Jaws, he says he thinks they might have a score to settle with him. But Benchley loved sharks. Concerned that his book and the movie gave them an undeserved reputation as monsters, he became a passionate advocate of the great fish and the ocean and worked throughout his life and career to dispel many of the myths that surround them. His bestselling 2001 nonfiction book, Shark Trouble, remains one of the leading guides to understanding them. Benchley also wrote seven other well-received novels, many of which are set at sea (including The Deep, which was made into a successful 1977 movie starring Robert Shaw). But nothing would compare to the massive power of Jaws. FILM: Hopper shows up at the house unannounced with a bottle of wine and finishes off what’s left on Brody’s plate. NOVEL: Quint dies Captain Ahab-style, drowning after getting his leg caught in a harpoon rope. FILM: Quint is given a more cinematic and less literary demise, getting chomped on by the shark.